Steve Mackey received his first Grammy Award in 2011 and is fast becoming the leading composer of his generation as orchestras and ensembles worldwide continue to embrace and perform his music. John Adams has been at the forefront of contemporary composition for the best part of 40 years, his Pulitzer Prize in 2003 just one of countless highlights. The two composers are separated in age by just nine years, yet come from two entirely different generations. Mackey started out on electric guitar and was a child of pop culture, Adams learned clarinet from his father, and played in marching bands as a youngster. Stumble is inspired, Mackey says, by observing his toddler “learning to become human.” It opens as a child’s consciousness might: with sounds like an orchestra tuning, a little song on the celeste, with bits of percussion. When the piano enters, it is with plunkings that could be a child’s first grabs at the keys and these progress to fumbling efforts as one learns how to master the piano. By the end of the concerto the student has bloomed into a polished virtuoso, the concerto’s crowning moment being a wonderful yet frightfully demanding triple fugue. Stumble to Grace was co-commissioned by the St. Louis Symphony Orchestra, New Jersey Symphony and the Los Angeles Philharmonic. Mackey’s Sneaky March was commissioned by Orli Shaham for her Baby Got Bach series for pre-schoolers and one can clearly hear musical snatches which found their way into Stumble to Grace. 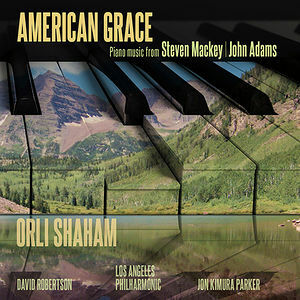 John Adams China Gates is for Orli Shaham the “opening gambit of contemporary American piano music.” Written in 1977, it is among Adams’s earliest works. His work for 2 pianos Hallelujah Junction (1996) is, according to Orli, “a work I can never get enough of” and remains one of Adams’ most popular compositions. Joining Orli on this recording is her husband David Robertson, one of today’s most sought-after conductors, revered for his programming and dynamic stage presence. Pianist Jon Kimura Parker has performed in concert with Orli since 2009. A veteran of the concert stage he won the Gold Medal at the 1984 Leeds International piano competition and, like Orli, enjoys an active media career hosting a television series on Bravo! and a radio program on CBC.